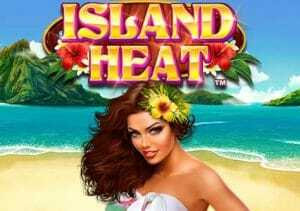 Novomatic invites players to a beautiful tropical paradise in Island Heat. It’s a simple 5 reel, 30 payline video slot that comes with stacked mega symbols, stacked wilds and a bonus round that awards up to 32 free spins complete with mega symbols. Play on your PC, tablet or mobile device from between 30p and £30 per spin. There’s nothing especially flashy about Island Heat. That true of the simple design and the rather basic gameplay. The setting is a tranquil beachside paradise. Joining the lower value A, K, Q and J symbols are flowers, a pineapple, a parrot and a dolphin. The smiling woman is the most rewarding symbol, paying 1.66 times your total bet if you land 5 in a line. That doesn’t sound like much for a top payer. On each spin, you’ll see a Mega Stack symbol which spins in fully stacked formation and makes it much more likely to fill multiple paylines with the same matching symbol (with payouts to match). This is known as the Mega Stacks feature. Also helping your winning chances is the Tiki totem which is the wild. As usual, this substitutes for all of the standard symbols. It also delivers some chunky payouts in it own right. The cashier rockets by 0.5, 2, 10 or 33.3 times your bet if you land 2, 3, 4 or 5 on a payline. The other symbol is the scatter. This spins in stacked formation on reels 2, 3 and 4 only. With 7, 8 or 9 scatters visible on the same spin you’ll land a payout of double your stake as well as triggering the Free Games feature. You’ll then go on to play 8, 16 or 32 free spins. The Mega Symbols are in play in the free spins, just like in the base game. You can’t trigger more free spins though. Novomatic has spiced things up with many of its recent releases. This is more traditional fare. The design and gameplay are very straightforward. It’s not as high variance as some in the Austrian developer’s catalogue either. The volatility here is in the medium range. There’s nothing too hot about Island Heat. It’s a perfectly serviceable video slot if you like Novomatic’s simple offerings though. With a win potential of 1,000 times your bet on each spin/free spin, other similarly themed video slots offer more in terms of win potential, gameplay and graphics – Iron Dog Studio’s Wai-Kiki and ELK Studios’ Sam on the Beach are better.